Money moves through your business via sales and if you’re not making enough sales, chances are you don’t have enough sales calls coming through. So why aren’t you? That’s what I’m going to cover in this week’s episode and how to get those bookings flying in! Hello lovely, it’s Yasmin Vorajee from Tiny Time Big Results. 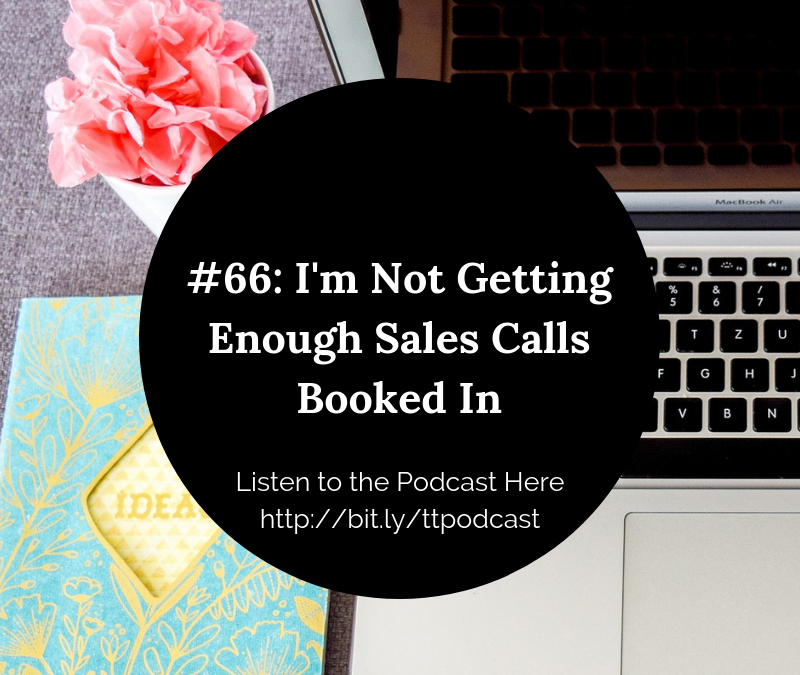 And today I want to address the question of why you may not be getting enough sales calls booked in. Why you don’t have a diary full of appointments with qualified prospects and people who are eager to work with you. This can happen to every single business when suddenly you might have enjoyed a really great run of sales calls booked in and then nothing. Or you might just be experiencing a bit of a drought in your business. So I thought I’d address some of the reasons why you might not be getting enough sales calls booked in. Now the very first thing that I want to address is the question of what is enough? You know if you’ve got tiny time and you’ve got 15 to 20 hours a week for your business, then chances are a big chunk of those will be for sales calls but you wouldn’t want to have say, 20 sales calls booked in because that’s all of your time pretty much gone. Of course, it depends how long your sales calls are, so when it comes to a Tiny Time business, we have to know what that number is. And this is really important and it’s something that I address in my book Tiny Time Big Results. If you haven’t got a copy, get a copy. It’s something that I address because I don’t think that people pay enough attention to this. How many sales calls do you actually need for your business, for you to be able to bring those sales in and to make the income that you want and to hit your monthly goals and your targets? You see the reality is, you might only need two clients every single month. So instead of thinking, oh my god I’ve gotta have 20 sales calls every month, imagine you have a 50% conversion rate. That means that if you convert half of your calls, you only need four calls booked in. So it’s really important to understand what the number is for you in your business. If you’re thinking ‘my target is I want to have five calls booked in every single week’, then that’s your number. So when you’re thinking, well I’m not getting enough sales calls booked in and you only have one then yes that’s the reality but if you’re getting four booked in, that’s actually very good. You don’t have to be panicking as much. Not that I recommend panicking as a business strategy because it very rarely works. So first of all, I want you to think about your numbers. How many do you actually want to get? Go back over your data, if you’ve been tracking it and see what your conversion rate is. And that can help you to determine how many sales calls you actually need to get booked in to your diary. Secondly, think about how you’re positioning the sales call. Most people know that when you’re booking a discovery call or a strategy call that there is an element of sales to them. Now, it doesn’t mean that it’s a pushy call or anything like that. It just means that it’s an opportunity for you to be able to connect with someone that you might be really interested in working with and finding out more about how they work and whether it’s a good fit. And for you as the business owner, it’s also an opportunity for you to be able to determine whether that person is a good fit for you. You’re interviewing both ways. It’s not just them interviewing you and you’re saying please give me the business. It goes both ways. I like to talk about the fact that I don’t do pushy sales. For me, it’s very much about making sure that it’s a good fit. So by the time someone books a call with you, they’re already thinking about booking with you to work with you. So think about how you position it. You don’t want to be putting out lots of offers for calls where people think that they’re gonna get something from you and then you give them something completely different. They then feel pressured because they suddenly think ‘oh this is a sales call. You said it was a coaching call’. Now they are under the impression that it’s now a sales call but they weren’t under that impression when they first booked. When it suddenly turns that way, if you’re not upfront about it in the first place, then that can be really uncomfortable. It can be really awkward and it doesn’t leave a good taste in your mouth. You want to be very open and honest and transparent about what you are offering. So, I offer a triage call. And that triage call is exactly what it sounds like. When you go to the hospital, a nurse does triage where she looks at your symptoms and goes over what the problem is and then makes a decision based on that. So it’s an opportunity for me to be able to understand what that person is struggling with and for them to be able to understand as well, so through the questions I ask, they think ‘oh god that’s where I’m really struggling’ and it’s a real diagnosis if you like. I’m very clear about that and what I always aim to do in my calls is to make sure that you walk away with ideas and plans that you can start to implement, even if I’m only talking to you for a short period of time. But the key thing here is that when somebody books a call with you, you must be transparent about what the outcome is going to be and what they will walk away with. I book discovery sessions and strategy sessions with people who I’m interested in working with because I wanna get to know them, I wanna get to connect with them. I don’t get flustered about the fact that the person may potentially sell to me. I want that because remember, they’re selling something that’s really valuable and they are providing a service. You are providing something that person really wants. So there’s no reason to get icky about it. But if you’re transparent and upfront and say, it’s not a pressured call, this is just a chance for us to see if we’re a good fit. Leave your monkey mind to just be quiet and go and play somewhere else. Approach that sales call with a sense of detachment from the outcome. It’s a lot more enjoyable. I promise you, it really is. It’s actually a great way to research your audience and to make sure that you are targeting the right people and you’re using the right words for your copy. look at the numbers, how many do you actually need? how visible are you about telling people that you have this option. Are you putting it on your blog posts, are you putting it in your videos Are you telling people about it. This is really crucial. Do they know how to do it. Is your booking form hidden on your website. Do they have to go looking for it. Are you being visible enough and letting people know that there’s a way for them to book time with you, to get to know you. I hope that’s been useful for you today. Let me know if you’d like to book a Tiny Time triage session with me. What I do is I walk you through my process which is essentially the five big problems I see lots of business owners struggling with when it comes to running a profitable 20 hour week business. So that’s my triage. And what I want to do is help you to understand where you may be struggling. And I have programmes and services that enable us to be able to plug those gaps in your business. It’s as simple as that. We don’t need to get all antsy about sales or about having a sales call, it’s just a way of service. Let me know your comments and thoughts below as well and I look forward to seeing you the next time. P.S. 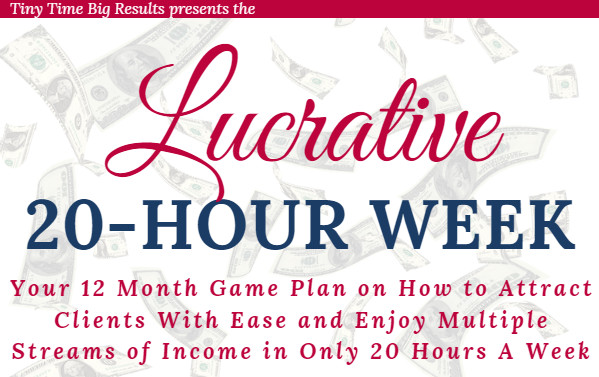 Have you got my free guide, The Lucrative 20-Hour Week Game Plan yet? Click the image below and get instant access!